Just what is an exersaucer? Is it from outer space and a sibling of the flying saucer? I assure you, it is not. For many years, parents used a walker to allow their babies to begin exploring the world around them. Some were equipped with a simple tray, some had toys attached. Either way, they all allowed a baby to move around a room freely while learning the basic concept of walking (Source). The only problem with a walker is, if you take your eyes off of your baby, there is a risk of harm. A few of the risks include falling over, pulling stuff down on top of them, and having access to electrical cords. Some babies have suffered severe injuries from falling, such as spinal fractures, broken bones, and head injuries. There is also an increased risk of burns if a baby gets too close to a heater, iron, fireplace, or pulls something hot from a table or counter onto themselves. Enter the exersaucer. The exersaucer is a safer alternative to the baby walker, with a much lower risk of accidents. Though it is safer than the walker, most pediatricians recommend using them for only short periods because, like a walker, constant use can delay development of gross motor skills. Floor play remains the recommended method of play for a baby, but there are times when parents simply need a moment for themselves. In these times, an exersaucer is a better alternative than a walker. So, back to our original question. What is an exersaucer? An exersaucer is similar to a baby walker, though it is stationary. Babies learn to simulate walking by using their feet to rotate the saucer. Most exersaucers have toys on the tray – some play music, others introduce babies to colors, animals, farms, and sea life. Exersaucers give babies the opportunity to work on balance and fine motor skills while giving them visual access to the world around them. The Evenflo Exersaucer Double Fun Saucer has two stages – a playmat for babies from birth to 4 months and a saucer activity center for babies over 4 months. The Bumbly theme features colorful flowers, bumblebees, and birds – introducing babies to world right outside their homes. Use the playmat to promote core and neck muscles while your baby learns to reach for toys. Older babies can rock, spin, and bounce as they develop gross and fine motor skills. Easy to assemble and start baby on the journey of learning while playing. This is one of the best exersaucers for 3-month-old babies. Babies can spin, bounce, and rock to promote balance and large motor skills. Lights and sounds/music keep babies engaged as they develop fine motor skills and discover various shapes, colors, and textures. 2 stages – one for tummy time and one for saucer time, giving baby the opportunity to learn and play from birth. 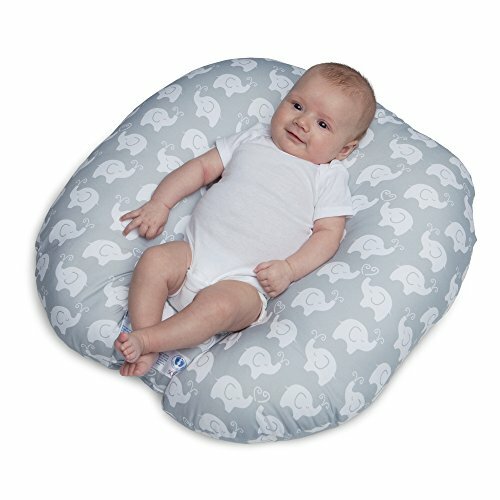 Washable and adjustable seat allows you to choose from 3 levels as baby grows. Springs are enclosed to eliminate the risk of pinching or getting caught in them. Does not collapse for portability. With a bright and colorful beach theme, the Evenflo Exersaucer Activity Center is one of the best exersaucers for 4-month-old babies and older. The Mega Splash exersaucer has bright colors and age-appropriate toys that promote fine motor skills, visual development, hand-eye coordination, and cause/effect learning. It also promotes gross motor skills by promoting balance and helping baby develop leg, neck, and back muscles. Featuring fish, seashells, and beachballs, this is a wonderful way to introduce baby to the beach. The removable and washable seat pad and food tray make cleanup a breeze. Bright colors and various textures promote tactile and visual development. It has a 3-position height adjustment that allows you to adjust the height as baby gets taller. Equipped with teethers that babies can pull to them for chewing. Rotates 360 degrees, allowing baby to begin learning the skills needed for walking. This exersaucer does not have lights or sounds. One of the best exersaucers for small spaces, the Oribel PortaPlay is a foldable activity center perfect for traveling. The PortaPlay promotes fine and gross motor skills as well as cognitive development. One of the best features of the PortaPlay is that, once your baby learns to walk, it can be turned into a table and used until the age of 5. Easy assembly with no tools required, you can have this up and running in no time and introduce your little one to forest friends they will come to love. Folds for portability and storage so that baby can play wherever you go. Forest friends transform to develop fine motor skills as well as introducing baby to the notion of cause and effect. Bounces and spins for developing leg and back muscles as well as promoting balance. 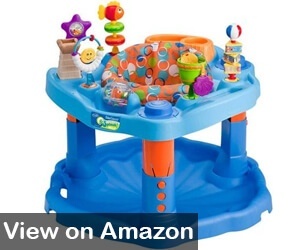 Two stages – exersaucer and table – so that your child can use from 5 months to 5 years. The play center does not have lights and sounds/music. 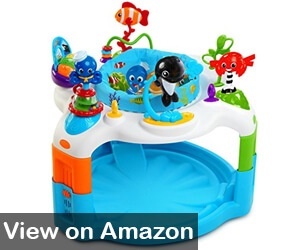 As one of the best exersaucers for 6-month old to 12-month-old babies, the Baby Einstein Rhythm of the Reef Activity Saucer introduces baby to sea life – with a whale, octopus, clown fish, and other colorful sea-themed creatures. This musical exersaucer promotes fine and gross motor skills, hand-eye coordination, and allows baby to build leg muscles and learn balance. Easy assembly so baby can quickly begin to explore the undersea world. The exersaucer makes soothing ocean sounds so baby feels calm and comfortable sitting in the activity center. Removable and washable seat makes cleanup quick and easy. Equipped with an electric piano toy to introduce baby to music and the concept of cause and effect. Adjust to 3 different positions so that it grows with baby. 11 activities to provide plenty of play and learning for baby. This exersaucer does not fold, so it is not portable. 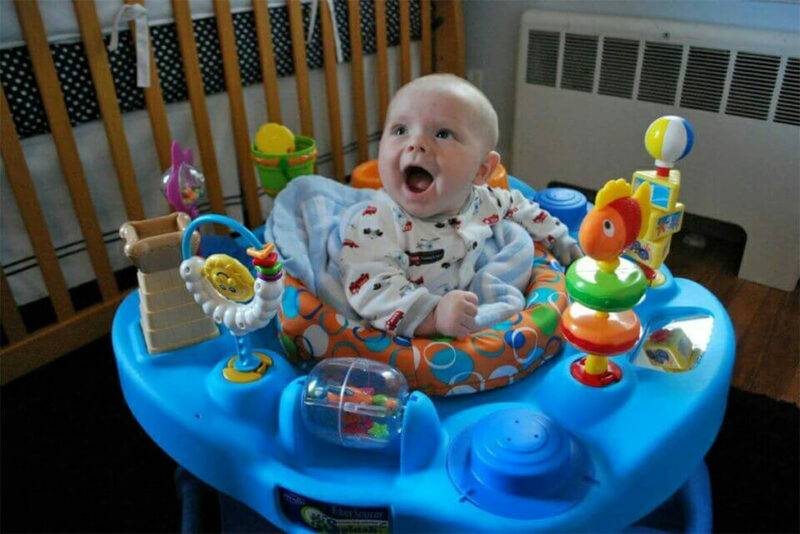 With a soft, removable play mat, the Fisher Price Step ‘n Play is one of the best exersaucers for small babies. 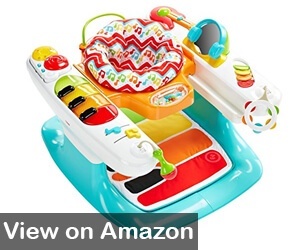 Providing plenty of stimulation, this play set introduces babies to music at an early age, and, as the baby grows, promotes eye-hand coordination, fine and gross motor skills, and offers many cognitive benefits. The piano keys teach babies to take their first “steps” as they learn to move their feet to make different musical sounds. There is also a hand keyboard so babies can make music with both feet and hands – providing hours of entertainment and learning. Parents can choose how the music generates – from short-play to long-play of pre-recorded music or let babies create their own music. Lights and music provide audio and visual stimulation to keep baby engaged. The microphone and tambourine rattles so babies are exposed to different many different sounds. The seat is adjustable and the seat pad is removable and machine washable for easy cleanup. The seat slides back and forth, allowing babies to take their first steps safely and without the fear of falling. Some parents have stated it is difficult to disassemble for storage and offers little portability. The Evenflo Exersaucer Jump and Learn Stationary Jumper is one of the best baby jumper exersaucers. 67 learning activities offer baby an almost unlimited learning experience – and helps develop fine and gross motor skills, eye-hand coordination, and has many cognitive benefits for baby. Baby can jump and spin in a safe environment while developing leg, back, and neck muscles and learning the balance needed to learn to walk. Developed with the help of the Child Development Institute, this exersaucer is specifically designed to help babies reach the most important developmental milestones. 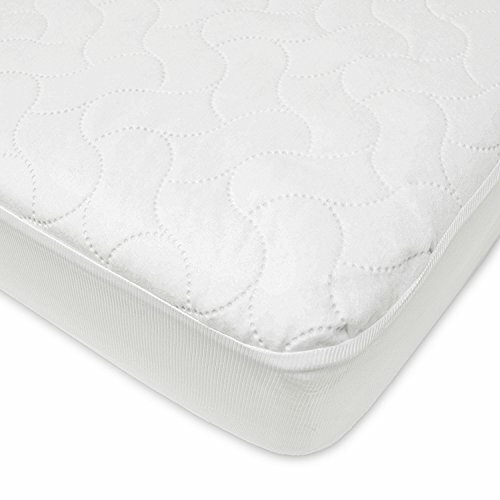 Bounce base features a soft landing pad for baby’s safety. Plastic toys and tray can be washed with soap and water to keep it as clean as possible for baby. Seat pad is removable and machine washable. 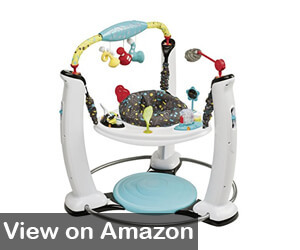 Stimulates baby with music, sound, lights, and plenty of activities. Spinning and jumping allows baby to safely exercise and develop back, leg, and neck muscles while playing. Requires 12 AAA batteries, which could become quite expensive if baby uses it every day. 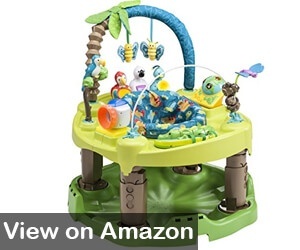 The Evenflo Exersaucer Triple Fun Active Learning Center has a Life in the Amazon theme, introducing babies to life in the rain forest with brightly colored birds and butterflies. This exersaucer grows with your baby in three stages – playmat, exersaucer, and activity table for babies after they learn to walk. There are 11 age-appropriate toys and music to help baby achieve developmental milestones, including tactile development, cognitive skills, fine and gross motor skills, and to develop a love of music in baby. 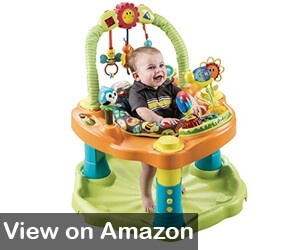 The three stages that allow this exersaucer to grow with baby makes this a toy baby can play with for years – continuing to develop the skills and muscles necessary for a successful life. Folds flat making it easy to transport and store. 3 height adjustments so baby has the most comfortable sitting position. Toys can be removed and used on other Evenflo toys that use the “Take with Me Toys” – so there is lots of room for variety. Music and lights make this a safe and entertaining environment for baby. Since the toys are interchangeable with other Evenflo products, some parents stated they come out of the base too easily. As a parent, our number 1 goal is to ensure our children are safe. This also applies when we are choosing toys. Here are a few tips from the US Consumer Product Safety Commission(Source). Always purchase age, weight, and height appropriate toys. If the packaging does not list these recommendations, contact the manufacturer for the information. For babies, toddlers, and younger children, be sure to check for small pieces that could pose a choking risk. Check new toys for sharp edges or small pieces that come off easily before you let your child play with the toy. Be sure to follow all instructions when you assemble the toy – if assembly is required. Periodically check your child’s toys for any cracks or breaks, sharp edges, or anything else that could pose a danger. Always use toys for their intended purpose – and teach your child to do so. When choosing an exersaucer for your baby, there are several things to consider. Some are simply preference while some are safety oriented. Perhaps one of the most important considerations is age and weight recommendations. Manufacturers make these recommendations so that baby is safe while using the exersaucer. For instance, if babies are not old enough to hold their heads up on their own, it would be a safety risk for baby – as well as extremely uncomfortable. Always check the manufacturer’s age and weight recommendations for any purchase you make for your child. While theme is more of a preference than anything else, it can be a key factor in choosing an exersaucer for your baby. Do you want animals or people? If you want animals, do you want sea life, farm animals, or jungle animals? 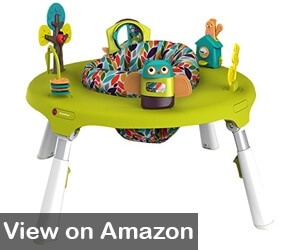 Color scheme can be important if you want the exersaucer to match the décor of baby’s nursery or your home in general. For convenience, you will want an exersaucer that has a washable and adjustable seat. Some exersaucers allow babies to bounce, which can be an added benefit. Baby can safely exercise by jumping up and down without the risk of falling. Extra features that keep baby engaged include lights, sound effects, and music. If a light comes on when baby pushes a button, baby is learning about cause and effect. The same applies with music and sound effects. Babies begin learning from birth – lights, sound effects, and music entertain babies as they learn more about the world around them. The most important thing to keep in mind when choosing the best exersaucer for baby safety. Always consider the safety of your child when choosing any toy or other purchase. Be sure there are no small parts that can be detached by baby. Also, check to see if there are any small spaces that could result in baby’s skin being pinched or a finger or toe getting stuck in a small hole. In choosing what I feel is the best exersaucer, I considered safety features (always the most important feature of anything meant for my child), learning features, and whether it will capture and hold baby’s attention. In other words, which of these top-rated exersaucers will benefit baby the most. With these things in mind, I feel the Evenflo Exersaucer Triple Fun Active Learning Center is the best exersaucer for baby. Because it has three stages, it can be used from birth until your child tires of it. The first stage is a playmat for infant tummy time, the second is the exersaucer, and the third is a play table that your child can play with for years. I also like that the toys are interchangeable with other Evenflo products, which adds a lot of versatility for baby. Another plus is that it has lights and music, as well as allowing baby to spin, bounce, and rock. As an educational tool, this exersaucer promotes fine and gross motor skills, eye-hand coordination, and offers many cognitive benefits as baby learns to differentiate between colors and sounds. For parents, the fact that the seat pad can be removed and machine washed is a plus. Another benefit for parents is that it folds flat and is easy to store or to take with you on the go. 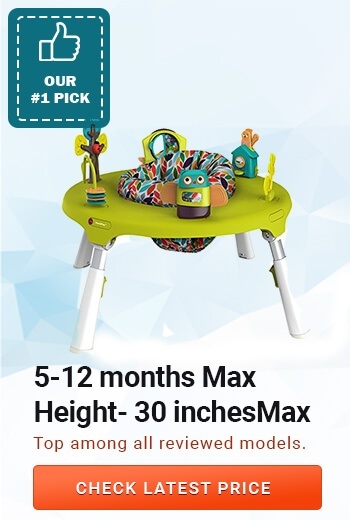 Of course, the fact that this exersaucer can be used for many years is another plus for parents, who want to get their money’s worth with any product they purchase. If you are looking for a all-in-one educational and entertaining toy for your child that provides a safe environment to learn and grow, the Evenflo Exersaucer Triple Fun Active Learning Center has you covered.